The Jalalabad suicide bombing occurred on 18 April 2015 when a suicide bomber allegedly affiliated with ISIL's Khorasan Province struck a bank in the city of Jalalabad in Nangarhar Province, Afghanistan, killing at least 33 people and injuring another 100. It marked the first major attack by ISIL Khorasan after it was formed three months earlier, in January 2015. ↑ "33 killed, 100 injured in Afghanistan blasts, ISIS claims responsibility". rt.com. ↑ Masoud Popalzai and Saleem Mehsud, CNN (18 April 2015). "ISIS motorbike bomber kills 33 at bank in Afghanistan - CNN.com". CNN. ↑ "Afghan blast kills 33; president blames Islamic State". Reuters. 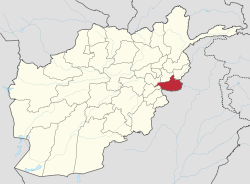 ↑ "Afghanistan suicide bomb in Jalalabad leaves many dead". BBC News.